This week may have been high summer in America with Fourth of July festivities from sea to shining sea, but the best jewelry looks in the world were not beachy thanks to the annual presentation of the Fall/Winter haute couture collections in Paris. One of the most stylish and star-studded events in the City of Lights, there was the unveiling of new fashions and High Jewelry by day. By night, there were equally glamorous parties to keep the show-goers, models and celebrities entertained till all hours. These events brought out fabulous jewelry in the coolest trends, that ranged from gem studded chokers to spectacular headpieces and layers of bangles and rings. Oh, and there was also a moment in London that had to make my short list. Zoe Kravitz enjoying some sweet treats in some new bijoux. 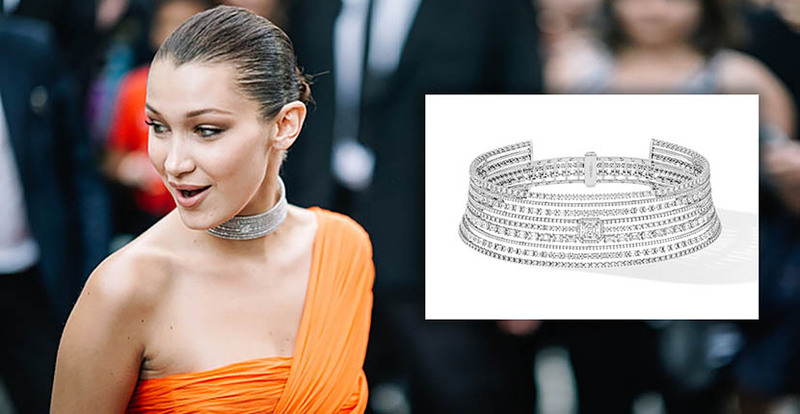 See the 5 best jewelry looks of the week that was below. 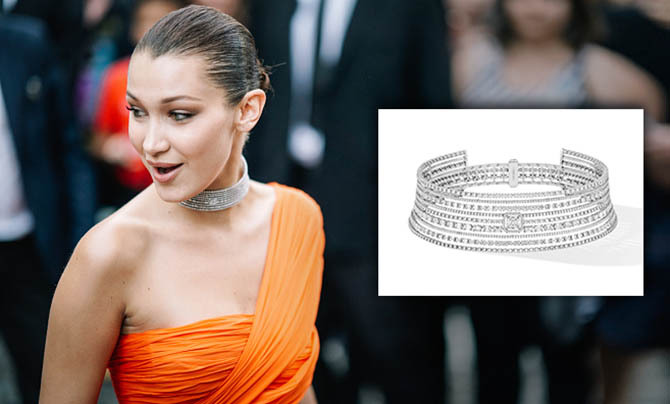 Bella Hadid sparkling in a Messika Paris diamond choker at the Vogue Paris Foundation Gala Dinner. Paired with a tangerine Giambattista Valli gown featuring a dramatic train, she looked every bit the elegant super model. Kendall Jenner rocked statement Lorraine Schwartz emerald, pink opal, yellow and white diamond earrings, worth over $1 million at the Vogue party. Her updo and minimal Mugler mini dress made a great backdrop for the spectacular color block earrings. Jennifer Lawrence has perfected high-low red carpet style. At the opening of the Dior exhibition at the Musée des Arts Décoratifs, the Oscar-winner and face of the brand sported a head-to-toe Dior look. She accessorized a silk embroidered fringe gown with layers of bracelets and rings from Dior’s fashion jewelry collection. Cara Delevingne stood out at the star-studded Vogue party with a super-cool accessory that sparkled against her platinum buzz cut. This occasion marks the second time she has bejeweled her scalp this year. At the MET Ball when Delevingne was still bald, after shaving her head for her role in a Life In A Year, she had a Chanel makeup artist paint her pate silver. The dazzling jeweled headpiece clipped in her platinum pixie in Paris, I am guessing, is also probably Chanel fashion jewelry. As for her other jewels, the model went Madonna, circa Desperately Seeking Susan, with a choker and rosary necklace. Zoe Kravitz redefined daytime elegance on an afternoon off in London. 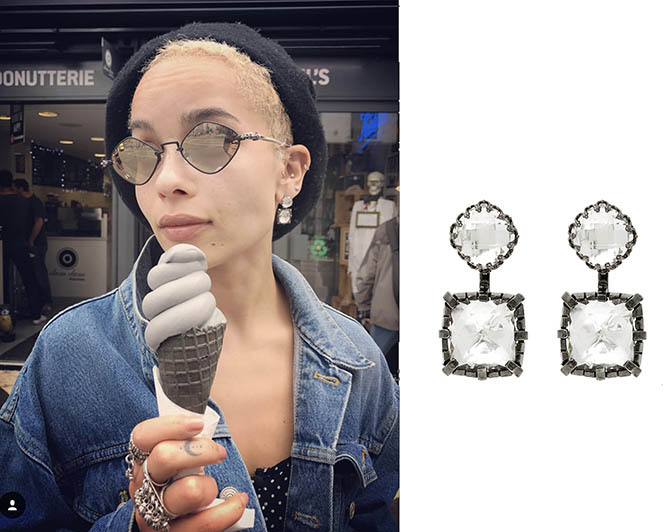 The star’s boyfriend, actor Karl Glusman, posted a photo on Instagram of Kravitz enjoying an ice cream and wearing her signature cool-girl denim with the Larkspur & Hawk earrings she purchased after a shoot for Net-A-Porter’s The Edit. The vintage inspired quartz and rhodium washed silver pendant earrings worked into Kravitz’s multiple piercings perfectly and showed just how popular antique inspired styles have become.